Growing up I had known only one Navratri the one that falls around the months of September/October. Its when we put on our chaniya chilis or saris and spent hours dancing, usually the garba and dandiya. It was when I entered the blogging world that I learnt that there are four different Navratris observed and celebrated in India. Nav means nine and ratri means nights. Nine nights are are celebrated in the name of Goddess Durga. During these 9 nines and 10 days many devotees of Durga Ma observe fasting. During the fasts some consume only one meal of fruits and milk only, some have no salt, some observe the fast by not consuming grains, beans and certain vegetables. There are some who fast by consuming only one meal. Sharada Navratri which translates as the Autumn Navratri. This is the Navratri that I tend to celebrate. Vasanta or Chaitra Navratri which translates as the Spring Navratri is usually observed and celebrated around March/April after winter ends. Magha Navratri which is usually observed around January/February. Not many people observe and fast during this time but the fifth day is important as Vasant Panchami when Goddess Saraswati is worshipped. Ashada Navratri which is observed around June/July. Again not many people observe or fast during this Navratri. This year the Chaitra Navratri begins on 6th April. The celebration will end with Ram Navmi, birthday of Lord Ram.The nine days are devoted to worshipping the nine forms of Ma Durga.These nine nights signify victory over evil. During this time satvik food is eaten, meaning simple food with no onions, garlic, fish, meat, eggs etc. As I mentioned before some observe fasting without consuming cereals, lentils and certain foods. What Foods can be eaten during Navratri? For this Navratri Fasting, I decided to make thalipeeth. It is a pancake or flatbread which is very popular in the state of Maharashtra. Usually multigrain flour is used to make them. The dough is prepared by adding spices, herbs and patted with fingers on a hot tawa or frying pan. Its usually then smeared with oil or ghee and allowed to cook on both sides. Its usually served with yogurt, a peanut yogurt dip, butter or just ghee. Here I’ve used only amaranth flour (rajgira) and added boiled and mashed potato to make thalipeeth that people fasting for Navratri can enjoy. Sift the flour into a big bowl. Add rock salt, cumin seeds, and sesame seeds and mix well into the flour. Add the remaining ingredients and form a dough. Use little water at a time. The dough should not be too soft or too hard. Heat a tawa or frying pan over medium heat. Have a bowl of water ready, and a wet small piece of cloth. Place the wet cloth on a board or rolling board. Divide the dough into 7-8 golf ball size parts. Take one part, place it on the wet cloth. Wet your fingers and pat it into a circle of about 4-5 inches in diameter. Lift the wet cloth with the thalipeeth from the corners and turn it over onto the hot tawa or pan. Let the thalipeeth roast for 1-2 minutes. Turn it over using a spatula. Let it roast for 1-2 minutes. Drizzle ghee or oil around it and cook till light brown specks appear on both sides. Repeat steps 8 – 12 with the remaining dough. In between you may need to wet the cloth again. Serve hot thalipeeth with some yogurt, butter, ghee or peanut yogurt raita (dip). Use aluminum foil or parchment paper instead of a cloth. If you can pat the thalipeeth directly on the hot tawa then use that method. Use mashed pumpkin or sweet potato instead of potato. Add water in small quantities when making the dough as it depends on the potatoes how much you may need. This post is part of organized by DESI BLOGGERS CONNECT facebook group. 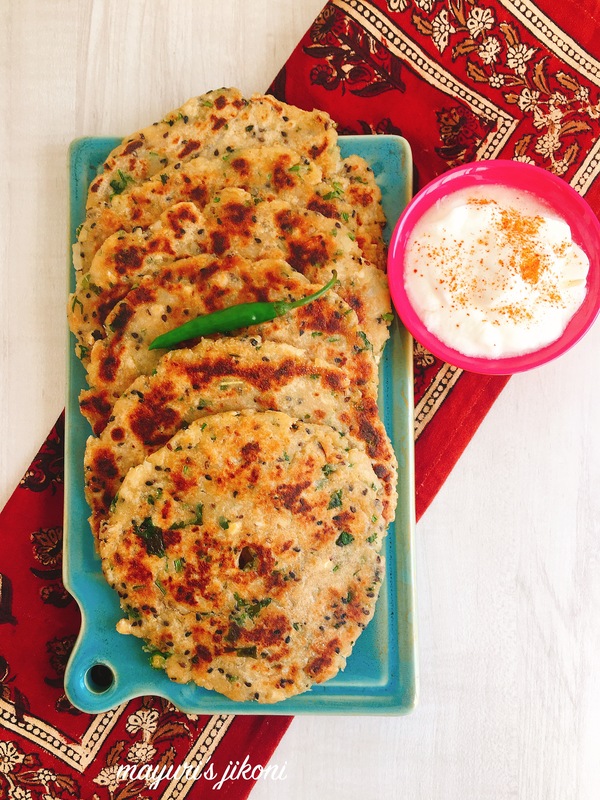 I am yet to prepare rajagro thalipeeth, such a delicious and nutritious way to enjoy fasting day with this flatbread. Its really filling and easy to make. If you make bajri Dhebra using the patting method then this is easy to make. Thanks Sasmita, I was told that making the hole in the middle ensures even cooking. Thanks Ruchi, do try them out as they are pretty easy to make. oh yum these thalipeeth so hearty mayuriji! love the perfect shape you have got! Hot thalipeeth with some yogurt sounds like a delicious combo! Thanks Priya, thalipeeth is fast becoming my favorite after theplas. Just awesome thalipeeth made out of Rajgira. This is my favourite grain Mayuri. Fell like grabbing it from my cell phone screen. Thanks Lata, I too love using amaranth flour. Such a beautiful and delectable thalipeeth! I could have this every day! I love the way you have explained about Navratri and the foods you can eat; a great boon for everyone! Thank you so much Vanitha, I too love these rajgira thalipeeth. Thank you so much Veena, I haven’t tried replacing aloo for this recipe but have replaced it for farali thepla with boiled and mashed plantain or sweet potato. Try it I’m sure it will work as it just has to hold the flour together. For me thaleepeth is such a labour of love more over it is one of the most filling dishes ever. The use of the super grain amaranth seeds is perfect for me now, I have a bag of rajgira flour and will try this. Thanks for the comment. Am sure you’ll love this gluten free flatbread. I have never had these before but they sound delicious . Bookmarking to try . Try them Nayna, its more like the cousin of thepla. Delicious rajgira thalipeeth. I too did not know about these 4 kinds of navratri. Thanks to you I know it. I too didn’t know till we had done a theme on Chaitra Navratri for FoodieMonday. That’s when I got to know about 4 different navratris. Never used rajgira. Rajgira thalipthalipeeth looks so delicious. Bookmaking it to try soon Perfect for fasting days. Lovely share.